place at the front door of the state’s flagship university. While they shared a veneration of slavery, the “Old South,” the Confederacy, and the ideology of white supremacy, many of their contemporaries in North Carolina and elsewhere did not. From its inception, the monument was exclusionary and offered a highly selective interpretation of the nation’s history. In the twenty-first century that interpretation is so incompatible with the principles we faculty and this university strive to uphold that the continued presence of the monument in its current location is a threat to the safety of the people of our university and a daily affront. 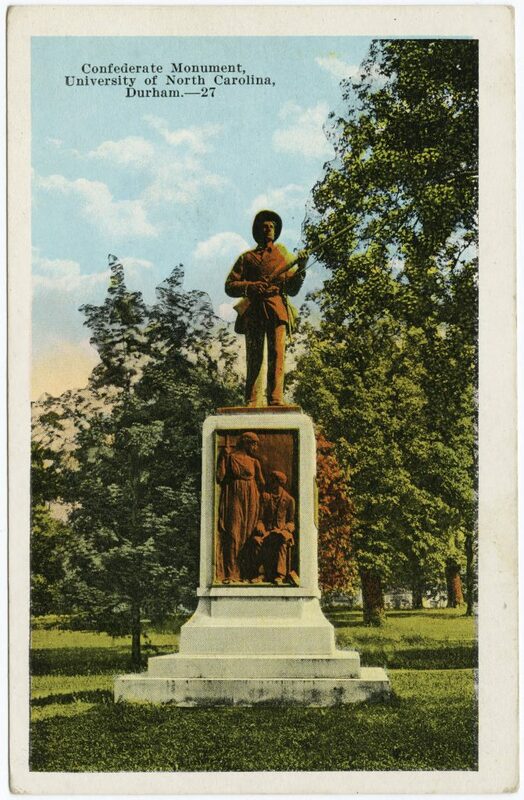 Moved to an appropriate place, the “Silent Sam’ monument can become a useful historical artifact with which to teach the history of the university and its still incomplete mission to be “the People’s University.” Until then, the monument will continue to promote malicious values that have persisted too long on this campus, in this state, and in this nation. This statement was released following a departmental vote. The agreed procedure stipulates that statements of this nature require the support of a minimum of 3/4 of the faculty who participated in the vote. In this instance, 41 faculty members cast ballots. In the interest of promoting fuller understanding of this statement and the controversy surrounding the “Silent Sam” monument, we encourage you to delve into the materials linked below. They include links to basic information about the monument and archival material related to the construction and dedication of the monument. Other linked materials include commentary by members of this department. Ph.D. Candidate Brian Fennessy discusses dedication speeches that were given at Confederate soldier monuments across North Carolina with The News & Observer. Department Head Dr. W. Fitzhugh Brundage discusses Confederate Monuments with TCLF, advocating to either put them in proper context or remove them. Former UNC Chancellor James Moeser, and department members William Sturkey and Fitz Brundage discuss the history and future of “Silent Sam” on WCHL. A paneled discussion with Carolina Public Humanities featuring Dr. William Sturkey, Dr. Harry Watson, and moderated by Dr. Lloyd Kramer. PBS Newshour’s William Brangham talks to Peniel Joseph of the University of Texas, W. Fitzhugh Brundage of the University of North Carolina, Pierre McGraw of the Monumental Task Committee. Important facts about the Silent Sam statue. A list of books, articles, and similar resources detailing the history and present controversy surrounding the “Silent Sam” Confederate memorial on the UNC campus. A guide to primary sources held in the University Archives and other Wilson Library collections about the planning and dedication of Silent Sam and the discussion surrounding the monument in the years since.